Christian Ziege has been handed a last-minute call-up to Germany's Euro 2004 squad after Hamburg defender Christian Rahn was ruled out by injury. Rahn had been struggling for fitness since March and coach Rudi Voller eventually decided not to risk him and called the experienced Ziege instead. 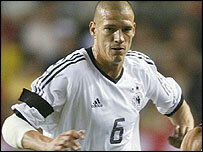 Ziege, 32, was in Germany's Euro 96-winning squad and has won 71 caps for his country. He was at Tottenham last season but has been told he can find a new club.